Having an organized kitchen saves you time, prevents unnecessary frustration, and makes cooking and entertaining a breeze. Whether you’re planning a complete remodel, or are just looking for some quick fixes to organize your countertops and cabinets, these seven tips will help you maximize the amount of storage space in your kitchen. The first step to having more space in your kitchen is to de-clutter and discard items you don’t need. You may be surprised how much space you already have in your kitchen when you eliminate any unnecessary appliances, gadgets, or nick-knacks. 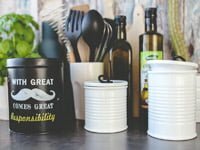 When considering whether to keep or toss kitchen items, ask yourself how many times you’ve used it recently, whether you have duplicates of the same item, or have something similar that could be used instead. After you’ve finished weeding out, donate any usable items to a local charity. Store items like tin foil, plastic bags, and dry goods in pantry or cabinet door racks that utilize the empty space between your shelves and the door. If you’re feeling creative, you can even use an inexpensive, over-the-door shoe rack for the same purpose. You can also attach bathroom towel bars to the inside of cabinet doors for storing cookie sheets, chopping boards, and lids to pots. Just be sure the screws are short enough so they don’t come through the front of the door. If you’re short on drawer and cabinet space, store frequently used items vertically in containers on your countertop. It’s an attractive way to display, but it’s also much easier that rooting through a drawer. When storing taller utensils, be sure to choose a container with some weight to avoid tipping. There are plenty of choices in metal, glass or ceramic that come in fun, quirky designs to add a pop of color to your kitchen. The backsplash of your kitchen countertop is an area that often goes unused for storage. You can add an amazing amount of storage space to your kitchen by installing a metal rod and using s-hooks to display mugs, utensils, or even pot-holders. This set-up can also increase the capacity of your dish drying rack, since you can hang mugs and utensils to air-dry on their hooks immediately after washing. Drawer dividers or pegs can be built-in or inserted temporarily, and help to organize your items while also making them much easier to store. Adding an additional slider for an internal drawer is especially useful for silverware or utensils. Store items you don’t use often in the bottom, and organize often used utensils on top for easy access. Simply roll back the top drawer when you need to access the bottom. Hanging pot racks are a great way to save space in your kitchen while making your favorite pots and pans easily accessible. They come in a wide range of shapes, sizes, and materials. Most hanging pot racks have movable s-hooks to allow you to arrange and space your pots and pans as needed. Take advantage of an empty wall, or even the side of your fridge, to install a magnetic strip for knives. A magnetic knife strip takes up much less space and does just as good of a job making sure pointy edges remain safely out of your way while you cook. 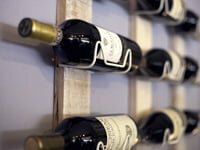 You can also take advantage of vertical storage racks for canned goods or add a wall-mounted wine rack to display your favorite bottles. These items not only save space, but make selecting what you need easier. Whether you are streamlining your kitchen for prospective buyers, or want a more functional cooking and entertaining area for yourself, these tips for maximizing space are a great start for affordably transforming your kitchen. Clair Jones is a Home Decor and Relocation Specialist with Movearoo.com. She specializes in restoring period houses, decorating on a budget, and helping other homeowners organize and maintain their homes. When she isn’t tackling a home improvement project, she can usually be found gardening, snuggling her pet chickens, or hiking in the mountains of Salt Lake City, Utah, where she resides.